Jobst Activewear socks have the feel of cotton and offers superior moisture management to keep feet dry, cool and comfortable. Extra cushioned foot with a reinforced heel. Seamless toe. All day comfort knee band. Appropriate for use by both men and women. Provides all day wearing comfort. 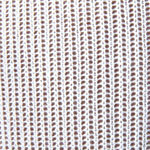 Fiber content 60 percent Polyester, 20 percent Nylon, 11 percent Cotton and 9 percent Spandex/Elasthan. Machine washable in lukewarm water Tumble dry low. Do not bleach or dry clean. Cool White.